Skeptical. Doubtful. Dubious. Let's just say I wasn't really so sure that I'd enjoy a restaurant committed to an entirely vegan, raw menu. It's not that I'm opposed to vegetables – I love them. But as an unrepentant omnivore who cares about flavor first and foremost, I'm wary of any dogma that would keep huge categories of delicious edible things off my plate, and even more suspicious of the notion that none of the things on that plate should be cooked. But that's the thinking behind Plant Food + Wine, Chef Matthew Kenney's new restaurant in Miami's Edgewater neighborhood. Kenney is a chef and "lifestyle" guru who also runs The Gothic in Belfast, Maine as well as another Plant Food + Wine in Venice, California. He has published several books and hosts "Culinary Academies" to teach plant-based cooking techniques, all under the tagline of "crafting the future of food." Pleasantly surprised. That's how I felt after my first meal at Plant. Despite an entirely vegan menu where no food is heated beyond 110° (and maybe even in some instances because of that commitment), the food at Plant was mostly quite delicious. Somewhat uncharacteristically for a restaurant that is in a sense defined by what it chooses not to serve, there's as much attention paid to flavor and presentation as there is to principle. And that's a welcome distinction. (You can see all my pictures in this Plant Food + Wine flickr set). The place itself is a stunner. 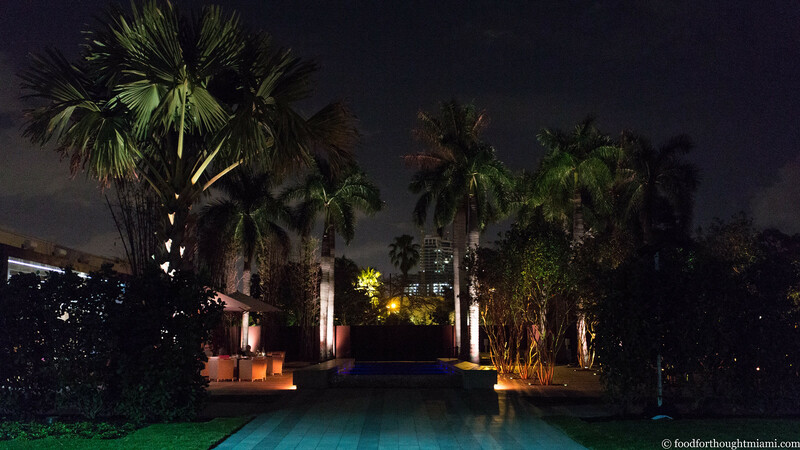 It's on a gigantic lot with a sprawling patio bisected by a blue-lit wading pool, surrounded by towering date palms. There's as much seating outside on the deck as there is inside the dining room, which feels open and breezy thanks to its double-height ceiling, bright white open kitchen, and retracting glass doors that open the indoor and outdoor spaces up to each other. The menu features several smaller items "for the table," followed by about eight "small plates" and around the same number of "mains," with most smaller plates priced in the low teens and larger plates hovering around the $20 mark. We ordered a couple of items from each section of the menu. I've often puzzled over why so much plant-based food feels like penance. Vegetables can be so bright and colorful, yet so much vegan food – all the "field roasts" and "chik'n" and their ilk – looks like processed pet food. That's not the case at Plant, where vegetables are rightly celebrated. 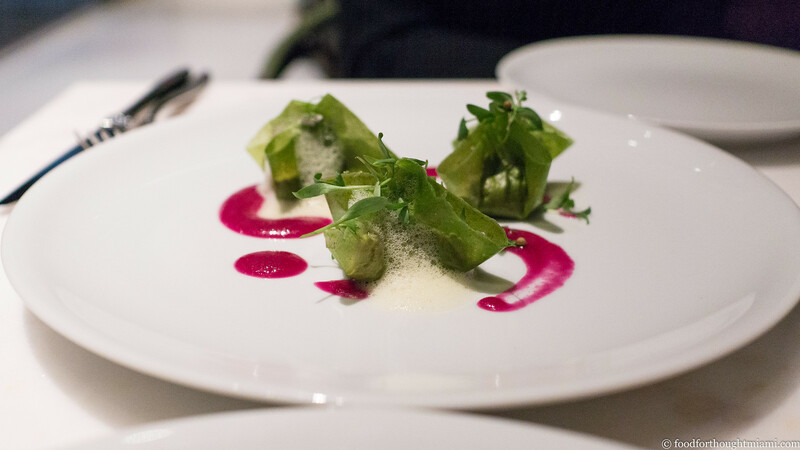 Kimchi dumplings feature bright green translucent wrappers wrapped around a nutty filling, with even brighter beet-dyed magenta swooshes adorning the plate. I’ve gradually come around to Gael Greene’s conclusion that most foams are “insipid,” but here's one that actually tastes pointedly of ginger and contributes a nice accent to the dish. 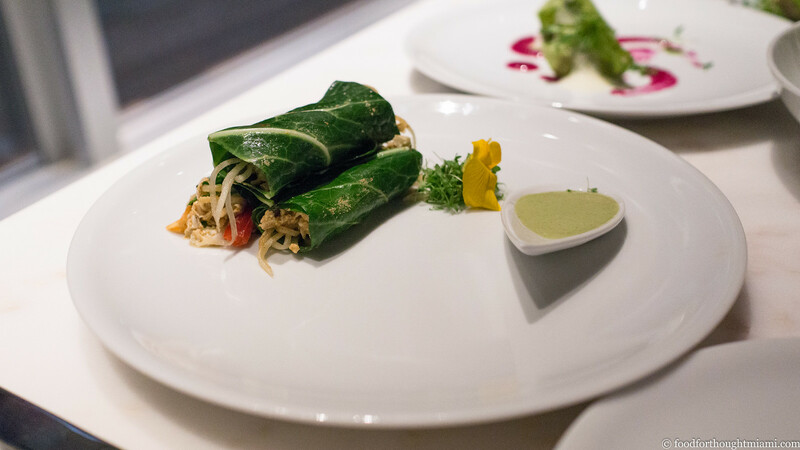 Banh mi lettuce wraps, another item "for the table," actually use deep-green collards for their casing, which are filled with a smoked chili-almond pate, crunchy napa cabbage, and slivers of pickled daikon radish and red peppers. A sunflower caesar salad uses both crunchy romaine and peppery arugula, dressed in a thick sunflower seed dressing with a rich, tahini-like flavor. Sunflower seeds play the role of croutons; briny capers even more effectively play the role of the traditional anchovies. It happens to be a great salad, mixing both bright and deep flavors and a bunch of nice textures. 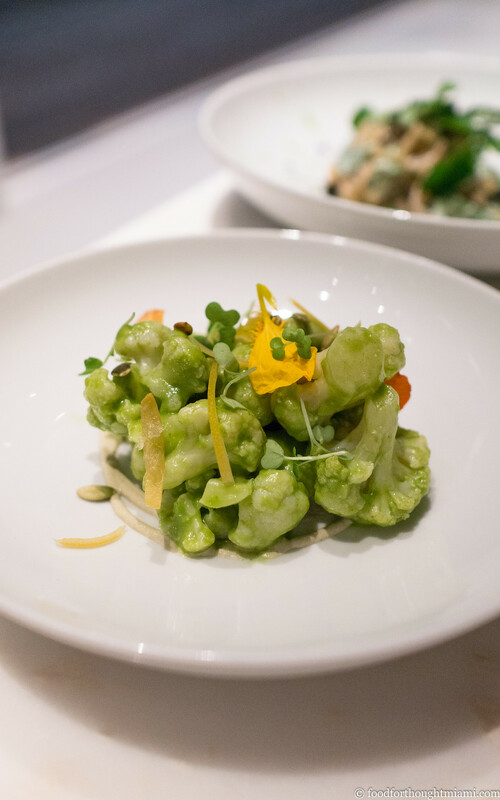 A small plate of romanesco cauliflower, lightly cooked to soften its raw edge, is tossed with a tangy salsa verde, served over a rich toasted pepita cream, and laced with ribbons of preserved lime. More good flavors: but I wished it had been given another pinch of salt and that the preserved lime had more prominence. The MK Bowl pictured at the top is listed in the “mains” – and I have to confess that while I have no opposition to salads generally, I often struggle to think of them as a main course to a meal. 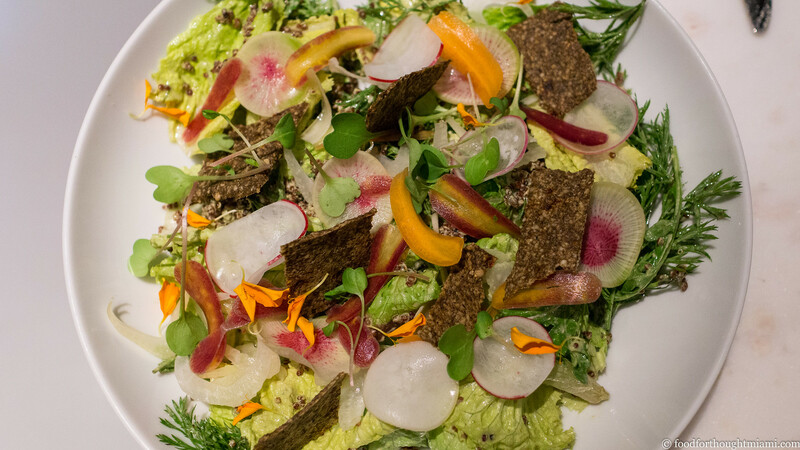 But this achieved a certain substantiality, combining delicate lettuces with heartier shaved root vegetables, creamy avocado, fresh sprouts, grassy carrot greens, and crunchy hemp seeds, all lightly bound with a tangy, savory lemongrass tahini dressing. I might have wished for the sunflower-chia seed “croutons” to have more crunch, instead of the texture of wet paper, but everything else here worked. Clearly, “cacio e pepe” couldn’t really be any such thing, and other than involving something in noodle form, it was not. But having said that, it was a genuinely delicious dish: slippery kelp noodles, dappled with a boldly flavored green olive purée, and festooned with fresh watercress leaves and little umami bombs of dehydrated black olive. For $21, I might have hoped for a somewhat larger portion, though. 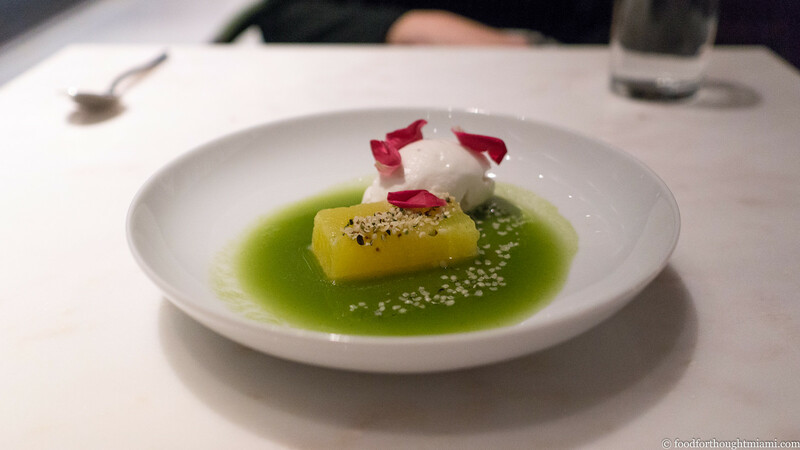 For dessert, a tranche of juicy compressed pineapple arrives swimming in an emerald-green basil emulsion, accompanied by a quenelle of creamy, cold coconut sorbet, all speckled with hemp seeds. It’s a nice, refreshing combination. Happily, it’s easy to find wine, beer and distilled alcohol that are vegan products, and Plant makes a point of doing so, as well as finding smaller, biodynamic producers. We were in a cocktail mood, and I liked the thinking behind a couple of the drinks we tried – one with gin, kumquat and rosemary, another with rye and citrus juice – but thought the execution could use a little more finesse and balance. Though we were plotting a second stop on the way home if still hungry (Mignonette's just a few blocks away), that proved unnecessary: I felt satisfied but not stuffed, and yeah, pretty darn virtuous. Many of these dishes highlight one of my bugaboos with much vegan food, though: the prevalence of dishes pitched as analogues to other non-vegan foods. Kenney has previously insisted that “It’s not about copycat food,” but a menu with “kimchi dumplings,” “banh mi,” and "cacio e pepe" would suggest otherwise. And for those of who have a choice to eat the real thing, anyway, the result is almost always an unflattering comparison. In this case, though, it seems unnecessary and often just confusing. Those "kimchi dumplings" have lots of good flavors, but oddly, pretty much none of them are anything resembling the salty, spicy, fermented funk of kimchi (even though it's pretty easy to make kimchi vegan). 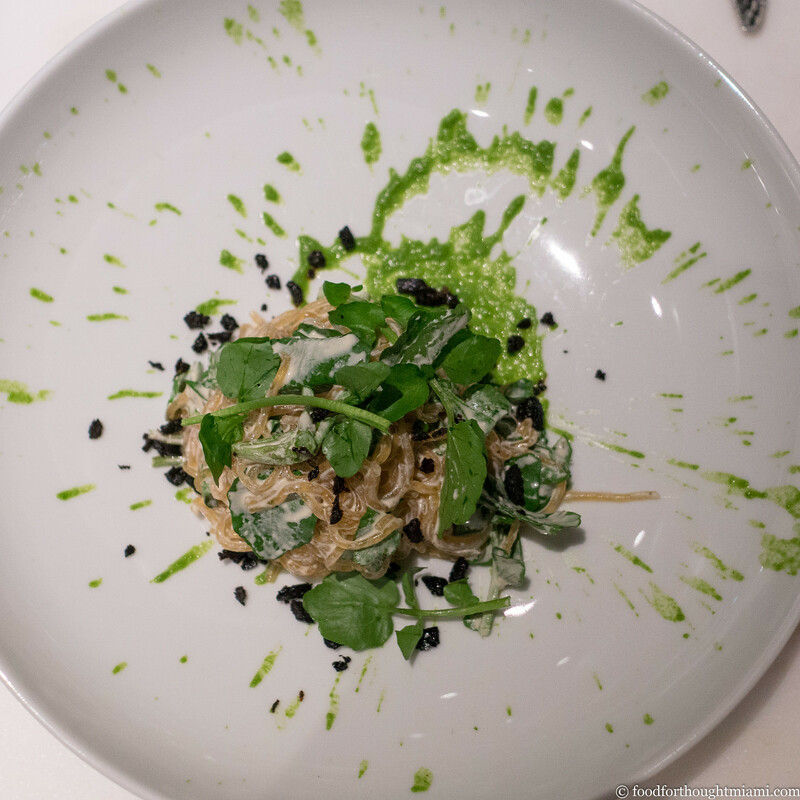 The "cacio e pepe" likewise has great flavors, with the freshness of watercress and the briny depth of the green olive purée and dried black olives, but comparing it to the classic pasta dish with pecorino and pepper is a setup for disappointment. And there's no reason to be disappointed. The real take-away is that pretty much everything we ate at Plant was delicious on its own terms. 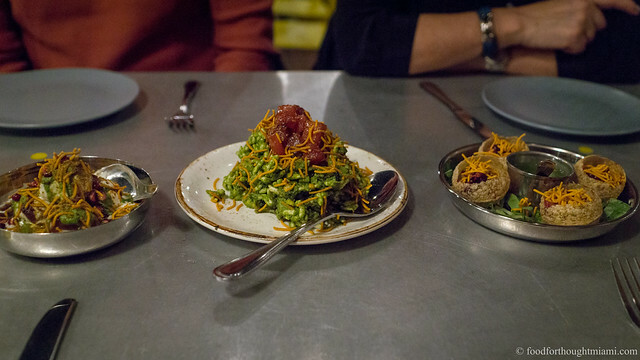 There's an attention to product, to technique, to presentation that I've rarely seen at a restaurant that features exclusively plant-based cuisine. For those who have chosen to eat that way all the time, but still care about good food, a place like this must be an absolute godsend. And even for omnivores like myself, it's a pretty exciting and well-executed change of pace. They're calling it Wynwood, but it's on NE 24th Street just west of NE 2nd Ave., on the Biscayne Boulevard side of the railway line. Pretty sure you have to be west of the tracks for it to be Wynwood. But it just shows how much Miami has changed in the past few years that everyone wants to call everything Wynwood now. This is not a full-blown review because Plant just opened last week and I've only paid one visit. But these "first thoughts" are perhaps longer and more detailed than usual because I'm pretty fascinated by the place, pretty impressed by the food, and am still sorting through my own thoughts on the whole vegan / raw food thing. As a side note, here (because I forgot to mention this before publishing this post), I will confess that I don't really get the whole "raw food" thing. Yes, there may be many foods which have higher nutritional content in their raw state. But there are also many foods whose full set of nutrients (to say nothing of flavors) are only released by the application of heat, there are some foods which are only palatable through cooking by some means. and some scholars suggest that cooked food has played an essential role in human evolution. 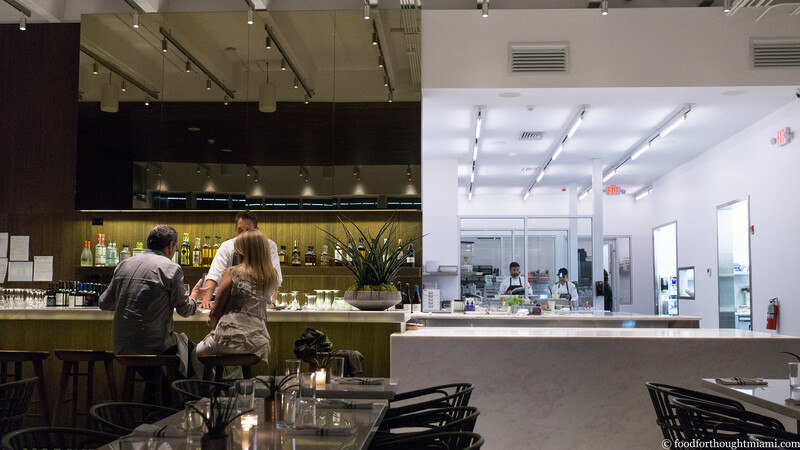 It's a little freaky to walk into a restaurant kitchen and not see a range anywhere – just dehydrators and immersion circulators and blenders and an anti-griddle and lots of counter space. 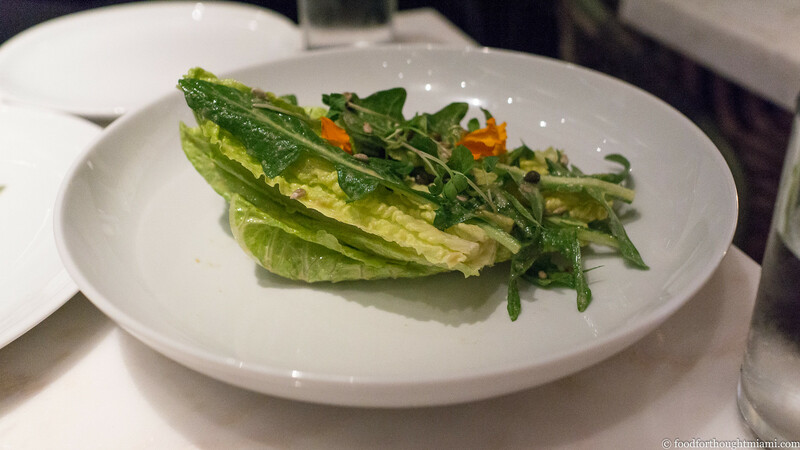 This brought back memories of an outstanding Caesar salad with tahini dressing and fried anchovies at a brief-lived place from a couple decades ago called Lure on Lincoln Road (not the current Lure Fishbar on Collins). This would seem to be always the case, but some wines use animal-based products in processing, and then there are the really odd exceptions like pechuga de pollo mezcal, filtered through raw chicken breast. Of course, distillation occurs at temperatures well over 110°, but I’m not going to be a stickler. I had the pleasure of visiting Plant Food + Wine Saturday night with the infamous foody Chambo. That American that lives in (and out of) Paris made many of the same observations. It was my first vegan experience, and a positive one. Our waitress was both delightful and knowledgeable. I can't wait to see what Chambo writes about our experience.